Love Everything Lovely - Fashion & Lifestyle Blog by Alena Votchits: Next New "It" Product? Essences + My Fave Toner! It hasn't been talked about much (at least as far as I know), but I do believe that it will become quite the talk of the "skincare town" by the end of the year. I actually didn't even know of essences until about the end of last year when I walked into Sephora looking for a toner I had just ran out of. However, I couldn't find it so I decided to ask one of the beauty advisors at the store. She asked me why I was looking for a toner, to which I responded that it helps assure that all of my makeup is off at the end of the day. Then, she wanted to know what kind of skin type I had. At that time, I was dealing with a lot of dry skin issues and my makeup would constantly look dry and "cracked" in areas. She explained to me that toners have alcohol as one of the main ingredients and that the last thing I needed was alcohol on my dry skin. Therefore, she recommended that I try an essence. She recommended the Boscia Cool Blue Hydration Essence in particular because it helps with redness and calming that down, which was another skin issue of mine. So what is an essence? To put it simply, it's basically a different word for a serum, but more lightweight. However, to Korean women, it's known as an essence. Apparently it is the Korean woman's secret to youthful skin because of all of the hydration it provides. Dr. Murad of Murad Skincare actually found that "the key to anti-aging is water and hydration." ♥ Fermented Yeast Filtrate: Rich in vitamins and minerals in order to provide brightness and moisture to the skin. ♥ DayMoist CLR: Strengthens the skin's ability to hold moisture. ♥ Sea Whip: A form of sea algae that is know to be the world's most powerful natural anti-inflammatory ingredient that helps soothe the skin from irritants and allergens. ♥ Caffeine: Anti-inflammatory to soothe the skin and antioxidants detoxify the skin. The caffeine also helps in keeping the skin on our faces firm and from losing elasticity as we age. ♥ Frescolat: A peppermint-like ingredient that adds a zing to tired skin. ♥ Jojoba Leaf: Nourishes the skin. ♥ Willowherb: Reduces redness and calms the irritation. How can you not purchase this essence after reading the benefits of some of the ingredients?! However, being a person that is oftentimes set in my ways, I still felt like I needed a toner even though the lady at Sephora said that it isn't something I should use. 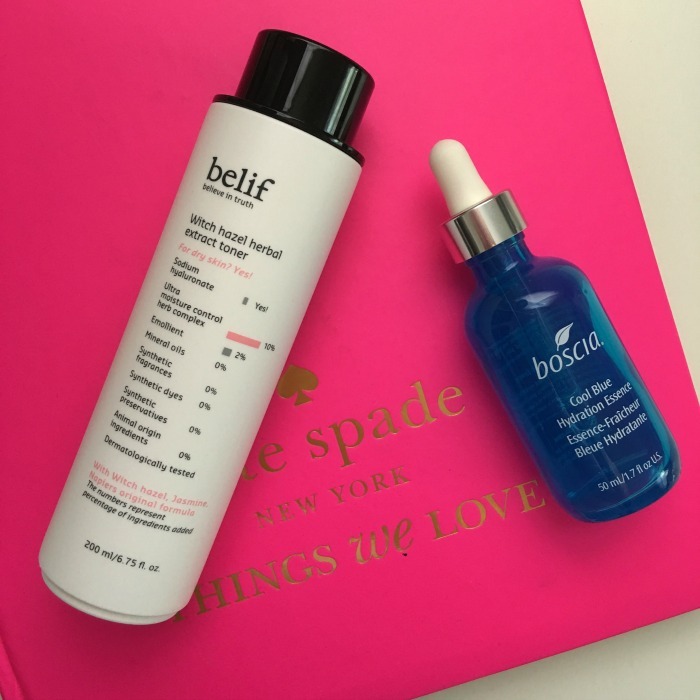 For a little while, I didn't use a toner after that Sephora run, but then I discovered the Belif Witch Hazel Herbal Extract Toner (what a mouthful!). Granted, there is alcohol in the list of ingredients. However, it is formulated with witch hazel, which helps with minimizing moisture depletion from the skin. The product inside the bottle doesn't even look like a typical toner. It is actually more of a lotion consistency rather than a liquid. Every night, after washing my face and before applying my night cream, I put a bit of the toner on a cotton pad and run it over my face. That way, I can see that any remaining makeup is removed on the cotton pad while still applying a lotion in the form of a toner to my face, which doesn't cause my face to feel dried out. With the two products combined, toner at night and essence in the morning, I've definitely seen an improvement in my skin's texture. It has become significantly less dry and my makeup application has been smoother now than what it was towards the end of last year! If you want to amp up this "better skin" process even more, check out the "tea" concoction I speak of in this previous post. Handy Tip: When applying anything to your face, make sure to tap instead of rubbing! Tapping helps the product absorb better into your skin, but rubbing can eventually help to speed signs of wrinkles.